Love the t-shirt--credit for that goes to Paul Mathew Vineyards (although really John Holdredge, as he coined the phrase, but deferred its use to Mat). Too bad you didn't get to taste the wines, they're really beautiful. Put them on your list for next time. Wow - I've never had any one say my wine was "Not recommended." Every other review of the 07's has been very positive. What wine did you taste and what is your criticism? 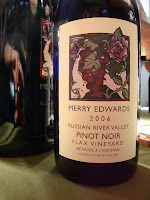 Hi Jim, I tasted the Jim Ball Vineyards Anderson Valley Pinot Noir 2007. I thought it tasted reductive, and the fruit tasted dried, not fresh. It wasn't pleasurable so I didn't take notes beyond that -- too many other wines to taste at that event. Your wine was recommended to me by another writer, so I was surprised and disappointed, but I can't write that I liked it when I didn't. Sorry to be your first negative. Not at all - I appreciate criticism whatever the view. In fact, I will take this back to the winemaker and see what we can do. I'm wondering if there was a bad bottle, because I have never heard that before. But thanks for the response. I also like to hear from the experts! Jim, thanks for taking it well. You might be right, it might have been a bad bottle -- as I said, it might have been reduced, and your wine was recommended by another writer. One day I'll try your wine again and we'll both be happy if I love it.